By the way, pyramid_persona is also a really nice example of advanced configuration tactics in Pyramid that show off the framework's plug-in friendliness. Before diving is, I should also mention that Michael Merickel's authentication and authorization tutorial is an indispensable reference. The Goal: The example I'm going to use is a very simple group-level authorization one. We'll create a site with a public side that anyone can interact with, and a private side that only allows access by users who have authenticated via Persona, and are known to the app as members of the admin group. We'll use the alchemy scaffold, so the app will have URL mapping via URL dispatch and persistence via SQLAlchemy. The persona settings are described in the Configuration section of the pyramid_persona README. The mako.directories setting is needed because we're going to use Mako for our login and admin page templates. Obviously, you'll want to use an email address that you have registered with Persona in place of me@example.com. All we've done here is hooked into Persona, and set up a welcome message and a sign-out button in lieu of any real admin interface content and funtionality. The request.person_js and request.persona_button attributes are available thanks to config.set_request_property() calls in pyramid_persona.__init__.py. Recall that I mentioned what a nice example of advanced Pyramid configuration pyramid_persona is - it's well worth reading Georges' code to learn how he has made things so easy for the rest of us. There are obviously some opportunities to use template inheritance here, to say nothing of the total absence of styling in those templates. The admin_signin function renders our admin_signin.mako template and packages it up as a 403 Forbidden response. That function is decorated with @forbidden_view_config() so that it will replace the default forbidden view that pyramid_persona supplies. That's how we get our sign-in page to appear when an unauthenticated user hits the admin URL. The admin_home function renders our admin home page stub. The important thing to note here is the permission='admin' argument in the @view_config decorator. """Simplest possible resource tree to map groups to permissions. Browsing to http://localhost:6543 should show you the default Pyramid app page - that's the public side of our site. and, if you inspect the requests and responses with your browser's web dev tools, you'll see that we got the expected 403 Forbidden response status. And that's all there is to it! Extending the site security to a more fine-grained group-level hierachy, or to object-level security should be relatively easy with the guidance in Michael Merickel's authentication and authorization tutorial. 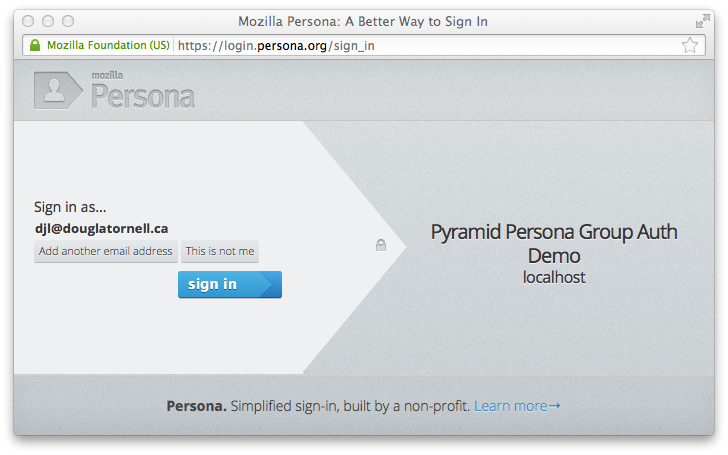 Thanks again to Georges Dubus for making this easy with the pyramid_persona library, and to Mozilla for creating Persona. Fixed typo in import statement for Administrator model. Thanks ppaez! Added index on persona_email column of Administrator model. Thanks Georges Dubus!